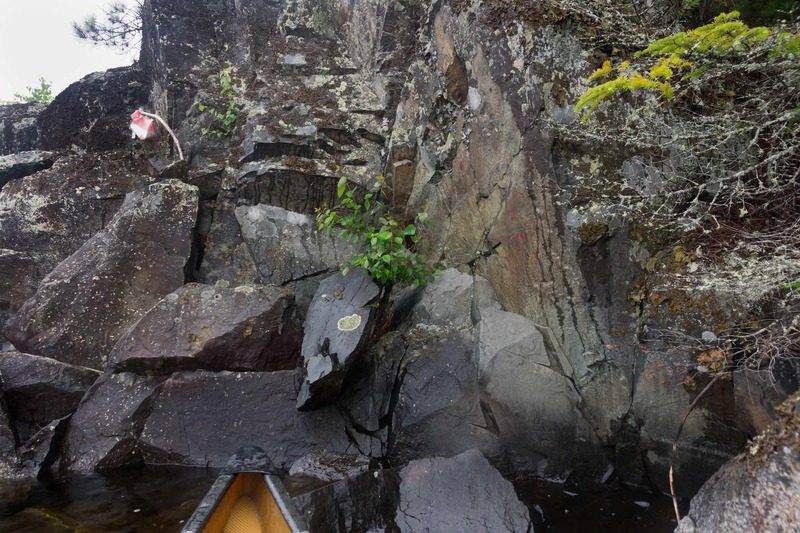 On a recent canoe trip, we spent a couple of days checking out the pictograph sites on Little Missinaibi Lake on the Little Missinaibi River system. 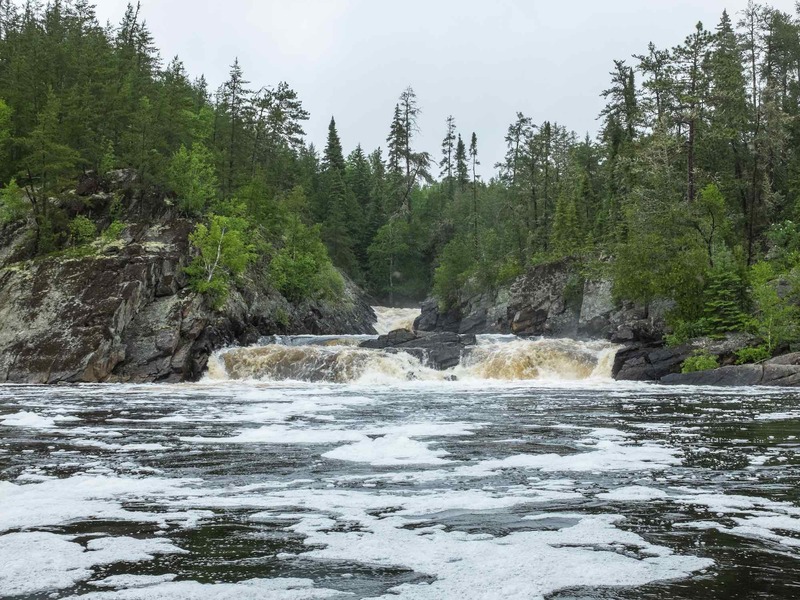 Then we paddled down the river to its dramatic merging with Missinaibi Lake at Whitefish Falls and tented at the fantastic site not far from the bottom of the falls. For the Ojibwe of old, the shelter of Whitefish Bay made for an excellent springtime gathering spot. The west side of the bay would have been where they put up their wigwams. These days there is a “Sensitive Area” sign there to discourage artifact hunters from messing with the site. Across the bay on the shoreline to the right of Whitefish Falls is another reminder of those who once lived here on a seasonal basis. 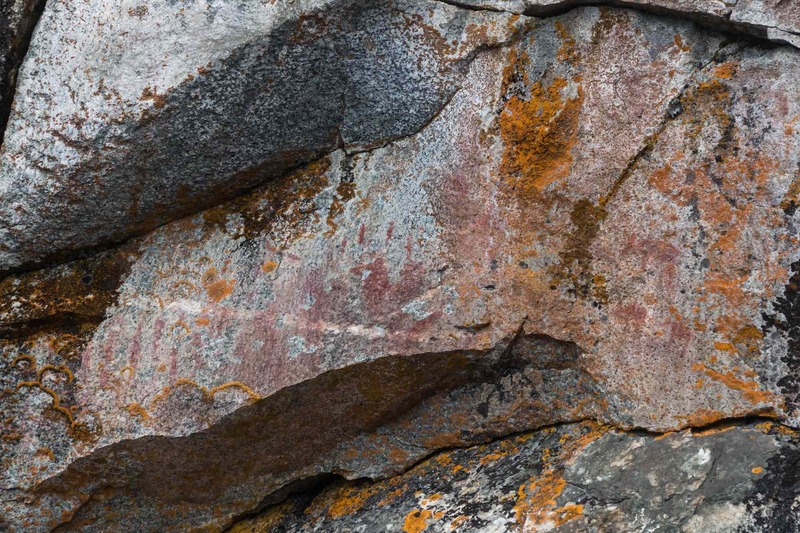 “Painted” on vertical rock surfaces with hematite powder mixed with fish oil are pictographs derived from their culture’s mythological image bank. It makes sense of the very name of the Lake. 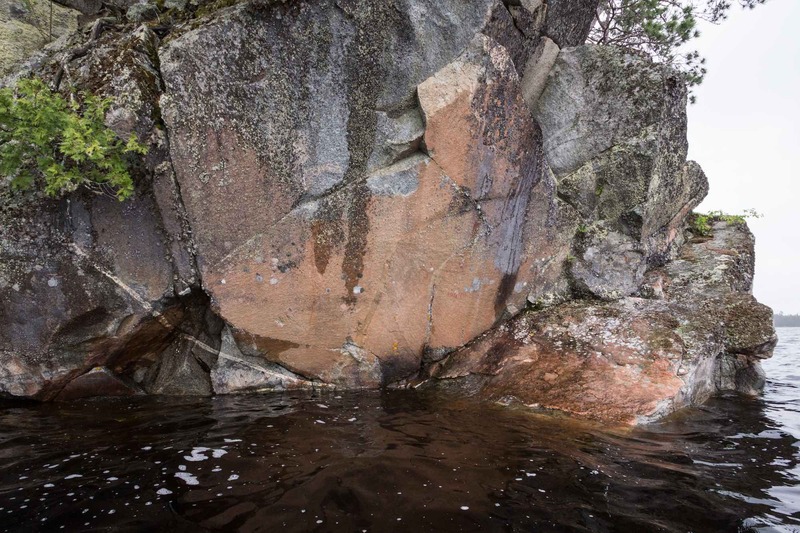 Like the Mahzenahzing River by Collins Inlet or Mazinaw Rock in eastern Ontario’s Bon Echo Provincial Park, the name Missinaibi comes from the Ojibwa word muzzinaw meaning “painted image”. Whitefish Bay is one of three pictograph sites at the west end of the lake that we would visit over the course of three hours. 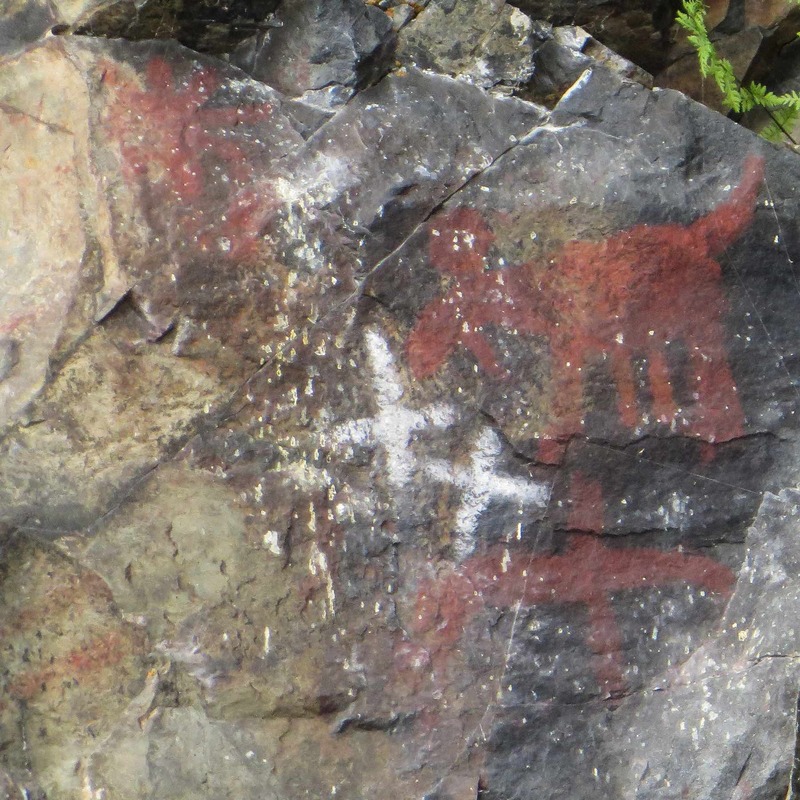 Along with another minor site at Reva Point and perhaps north-eastern Ontario’s most dramatic site at Fairy Point, it makes for a great introduction to Anishinaabe pictographs. They are an expression of the Woodlands culture of the past two thousand years that the Anishinaabe – the Ojibwe and Cree among them – were a part of. 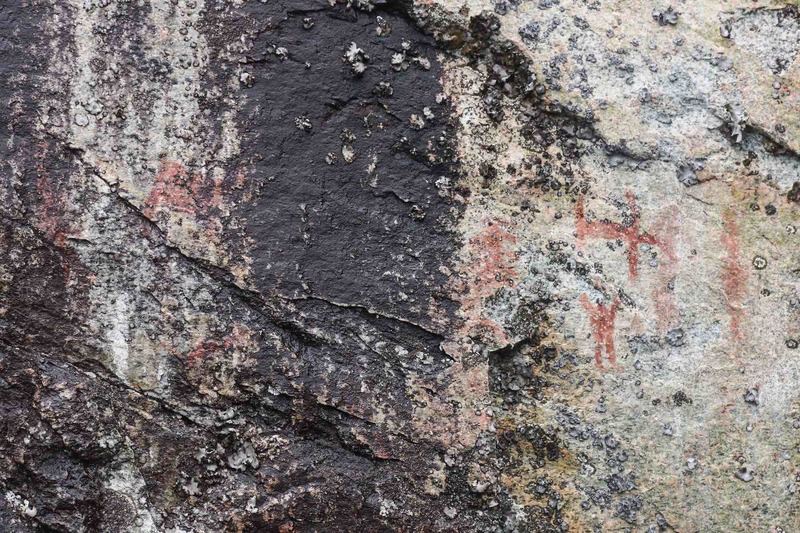 The Missinaibi Lake pictographs have obviously been the subject of study by archaeologists keen on a better understanding of traditional Ojibwe culture and beliefs. 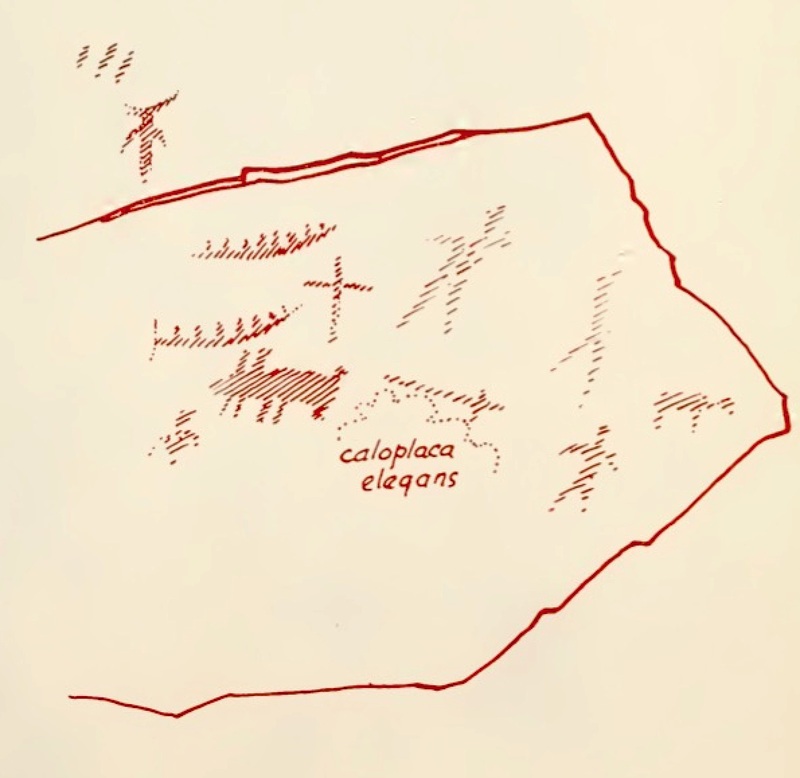 Thor Conway worked as an archaeologist for the Ontario government in the 1970’s and 80’s and, along with his wife Julie, recorded and analyzed dozens of pictograph sites in northern Ontario. 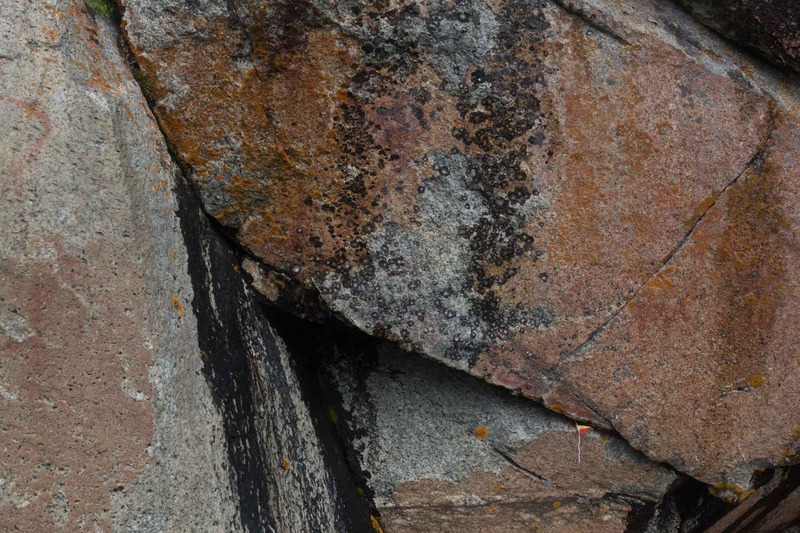 His recent book, Discovering Rock Art: A Personal Journey With Tribal Elders has a chapter on the Missinaibi Lake site at Fairy Point; another chapter deals with the Pothole site on nearby Little Missinaibi Lake. 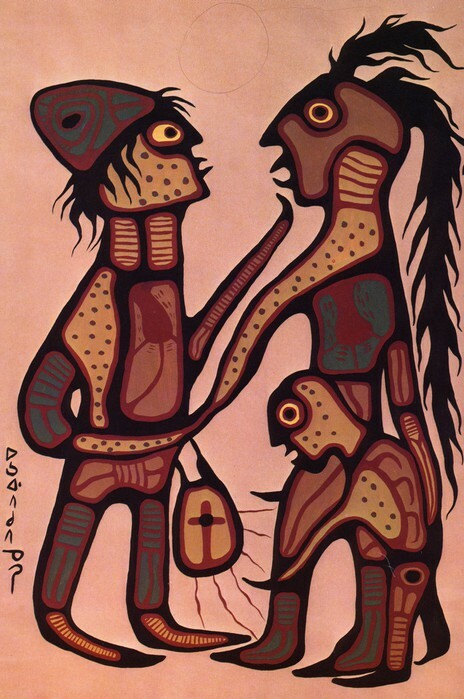 Both he and Dewdney made a point of seeking out Ojibwe elders for their understanding of the pictographs and the stories behind them. See here for a link to the book at Amazon. You can also order the book directly from Conway – see here. 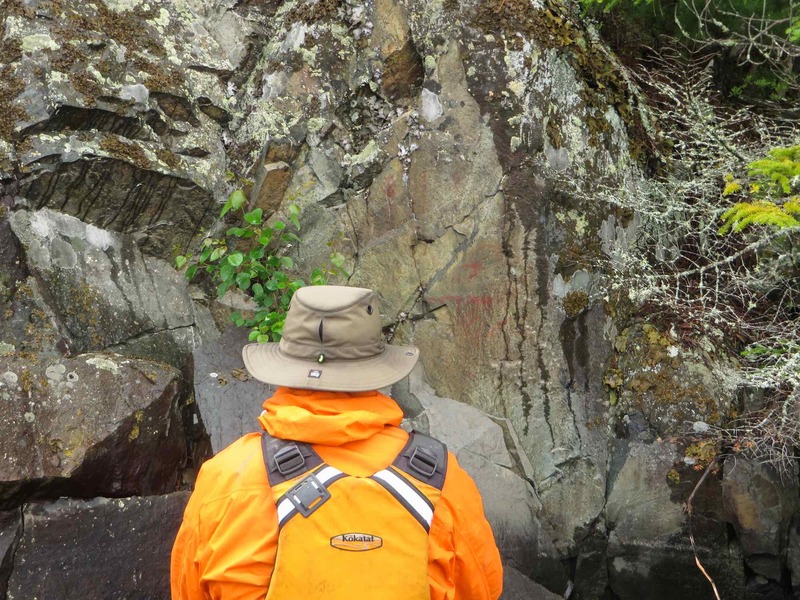 We paddled along the east shore to the first pictograph site. Had we been using the Ontario Parks map above we would never have found it! It has the site on the other side of the bay – i.e. 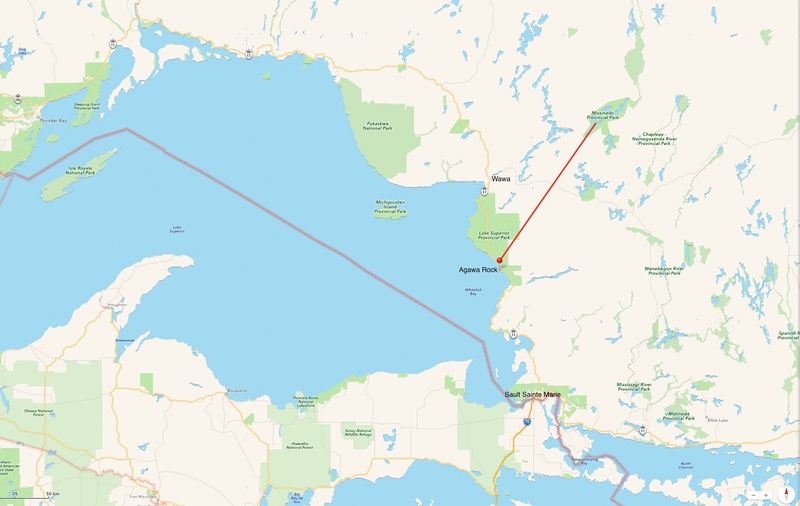 where the traditional Ojibwe seasonal camp would have been! 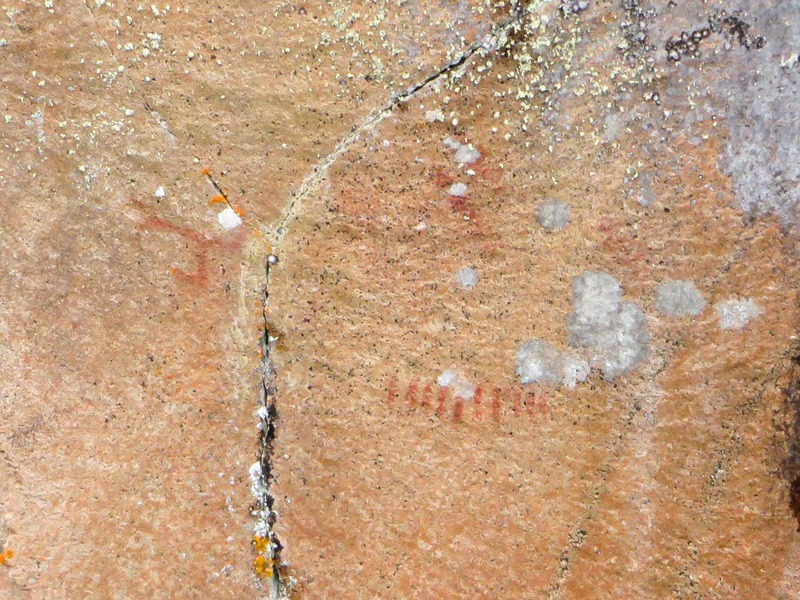 Amazingly it also has the next pictograph site – the one on Reva Point – incorrectly located. It is definitely not south of Reva Island! The photo shows the Whitefish Bay site near the end of the bay as we paddled towards it. 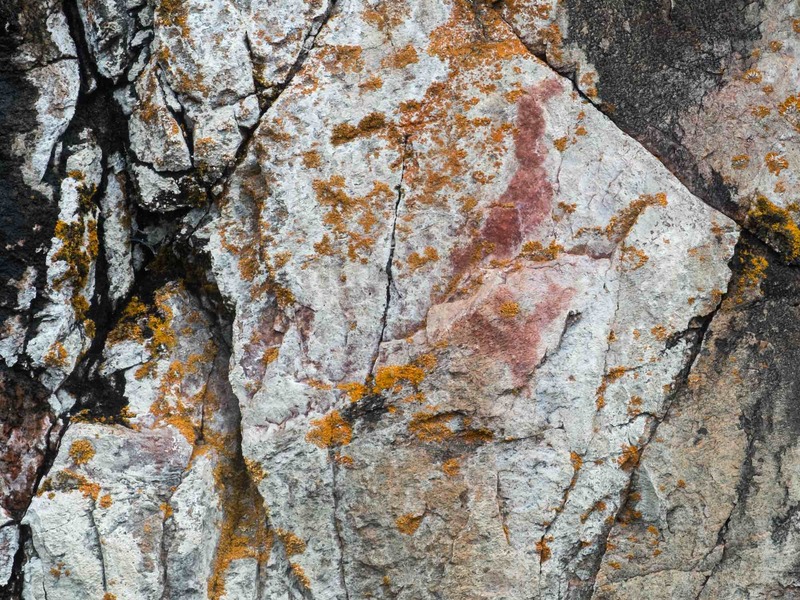 The site is a minor one and sometimes had us wondering if we were looking at ochre images or natural reddish veins in the rock. 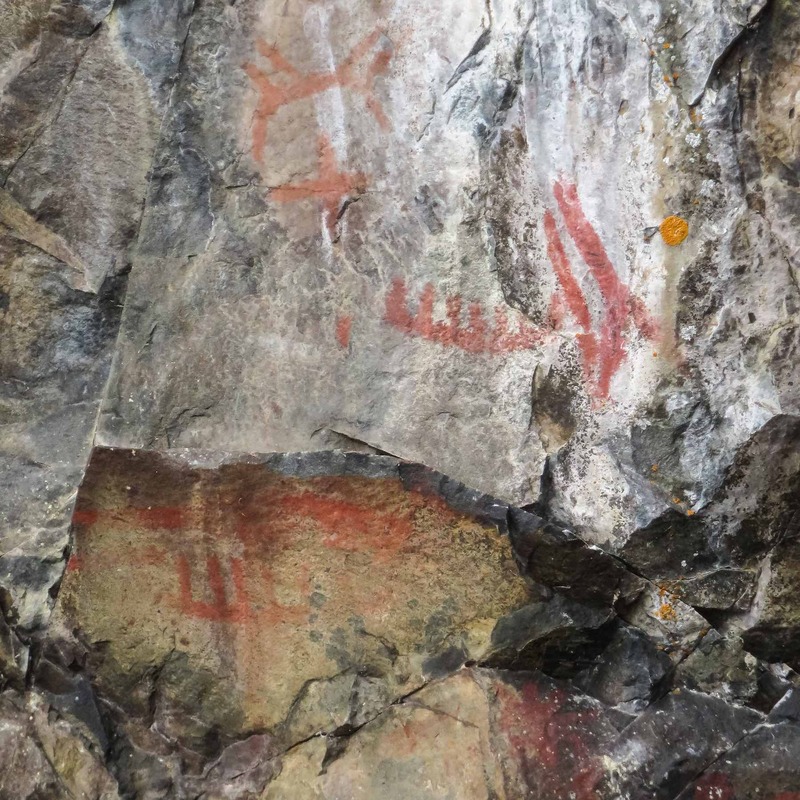 We had to make sure we did not succumb to “picto fever”, that urge to see pictographs were none actually existed! We could not decide whether 1. was just some underlying red granite exposed through the white calcite covering. It could be a series of vertical slash marks – often referred to as tally marks and implying that something is being counted. What do you see? 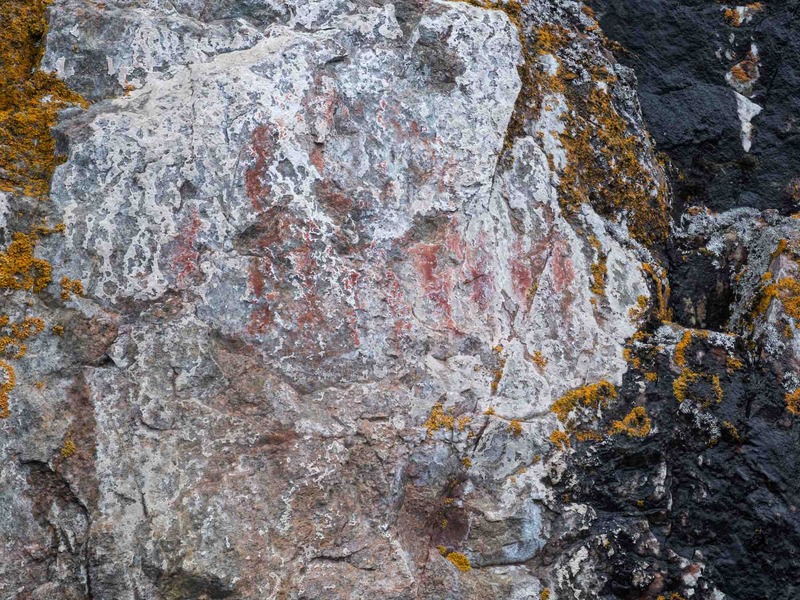 2. is another “difficult to say” bit of red peeking out of/painted on top of the whitish rock. Is it a bird figure with a V figure underneath? Or is that a head I see inside the V which could turn it into a human figure with outstretched arms? 2. – Whitefish Bay – bird figure and human with outstretched arms? We agreed that 3. is an actual pictograph or two. 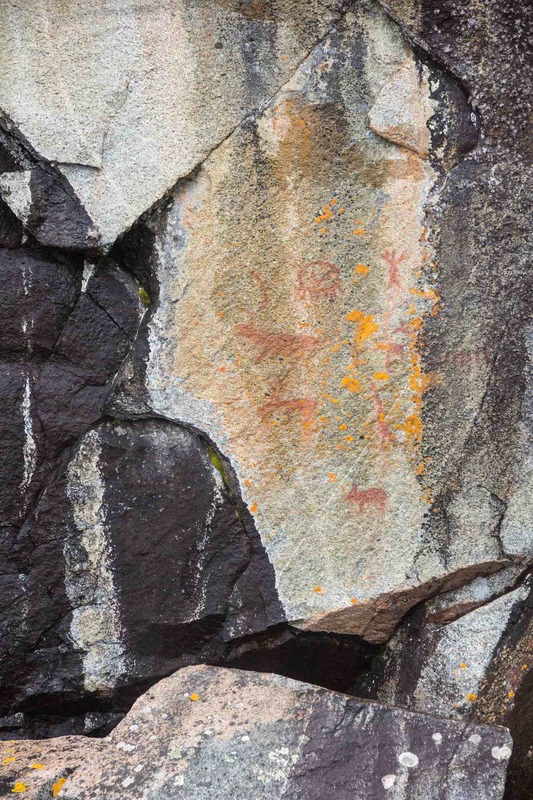 On the left an animal or fish figure and to the right three tally marks or – if that is an arc that the three tally marks are on top of – a canoe with three people in it. 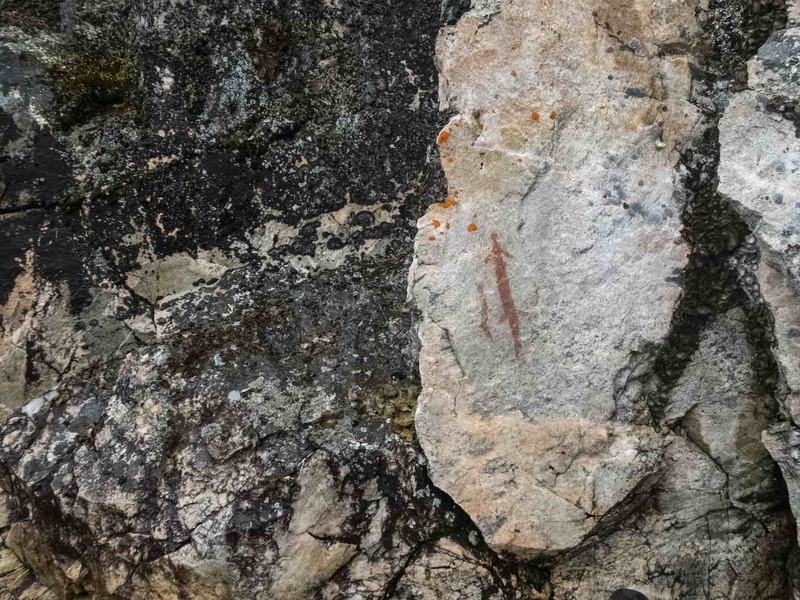 4. has slash marks – or are they just rock veins of a reddish colour? 5. has what looks to be an animal figure with a horn protruding from its head. Behind it are a couple of oblique slash marks. 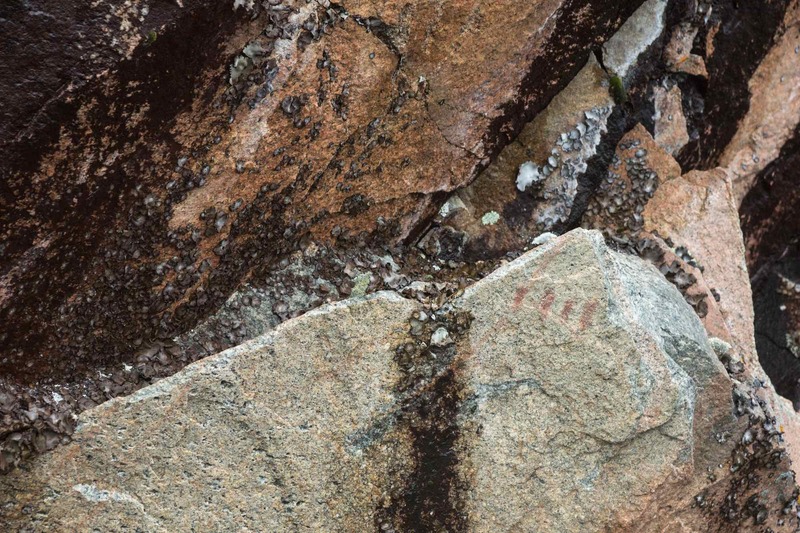 Are we looking at a crude drawing of Mishipeshu, a lynx-like reptilian creature and the snakes, the same combination of pictographs as that famous panel more skillfully drawn at Agawa Rock? It is easy to see how you can get into trouble trying to make sense of what you are seeing! Our slow paddle along the east shore of Whitefish Bay done, we headed up Missinaibi Lake in a south-westerly direction. While it was gently raining, we were still lucky this day – no SW wind! We have been on the big lake a few times and have seen the winds blow up some serious waves. Luckily, on those occasions, we were heading down the lake to the start of our trips down the river and were able to make use of the wind with the impromptu sails we set up. 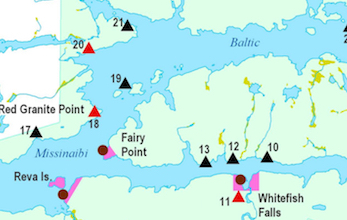 A little under seven kilometers from Whitefish Bay is the next pictograph location, like the Whitefish Bay one a very minor one compared to the Fairy Point site. As we paddled closer we noticed a Canadian flag on a stick to the left of the site. 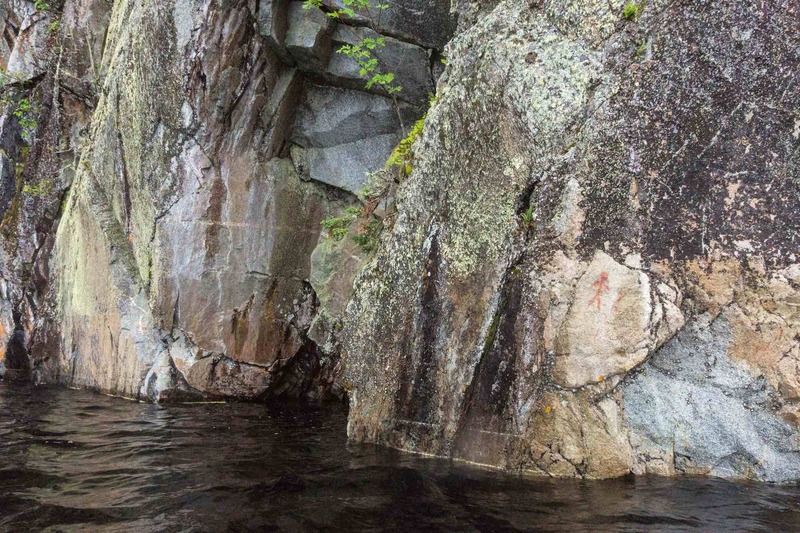 You can actually get out of the canoe here and step on the rocks as you view the pictograph panel. 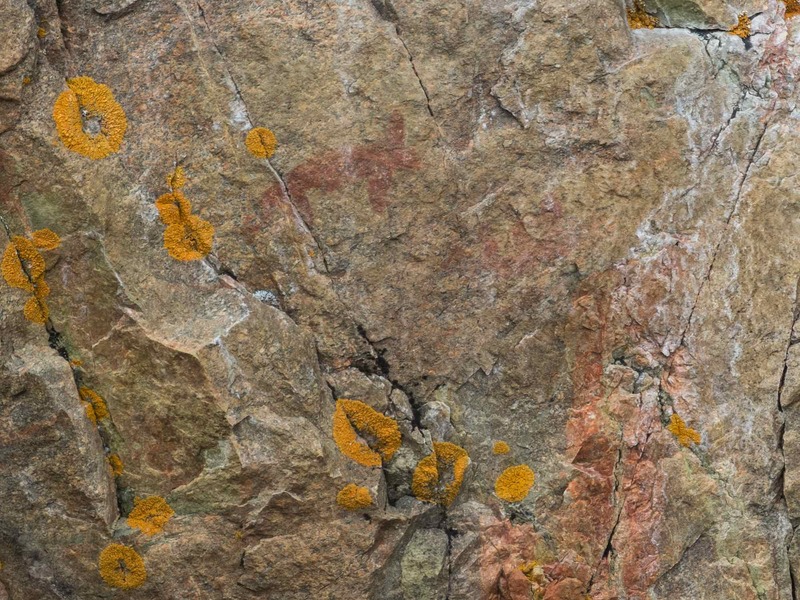 It is made up of seven or eight ochre images – most more clear that any on the Whitefish Bay site. Slash marks predominate but there are other more representational images as well. 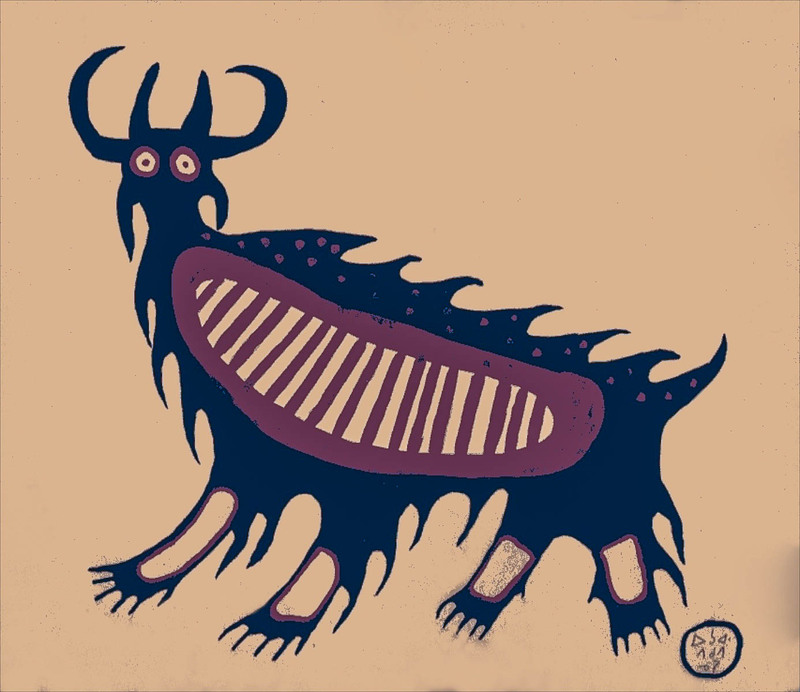 A figure with six “arms” and a “tail” on the top left, a simple Thunderbird image, and some other difficult to interpret markings. Underneath the Thunderbird (if that is what it is!) is the largest single splash of colour on the panel. 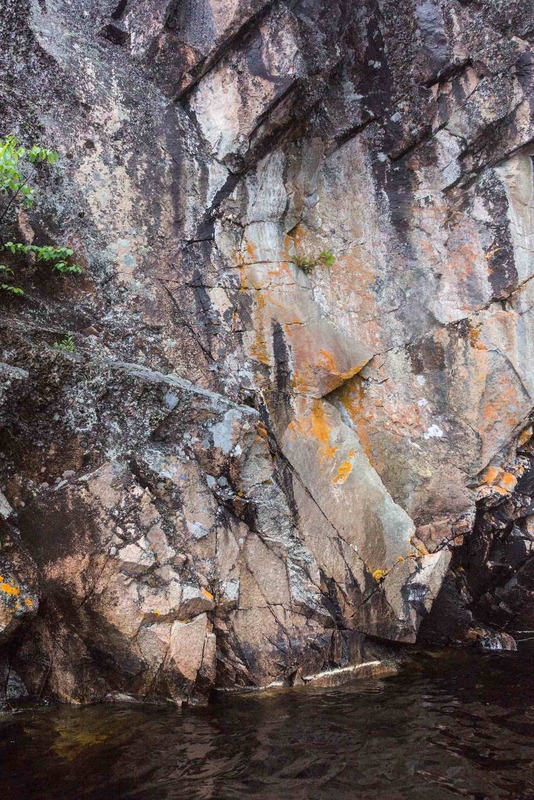 I started to verbalize a feline Mishipeshu-like figure on the left with a canoe with six paddlers on the right and snakes underneath – just like at Agawa Rock – but Max remarked that I was maybe getting a bit overly enthusiastic! We paddled over to Reva Island and the second “Sensitive Area” sign. 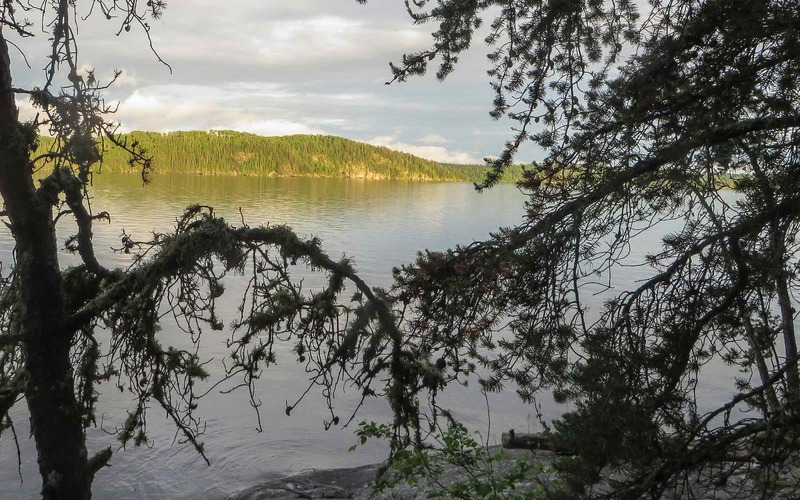 We had considered beaching the canoe and spending some time with the old grown white pines still found on the island – some apparently as old as 350 years – but the “you are not welcome” sign and the lack of any clear path had us looking towards Fairy Point instead. 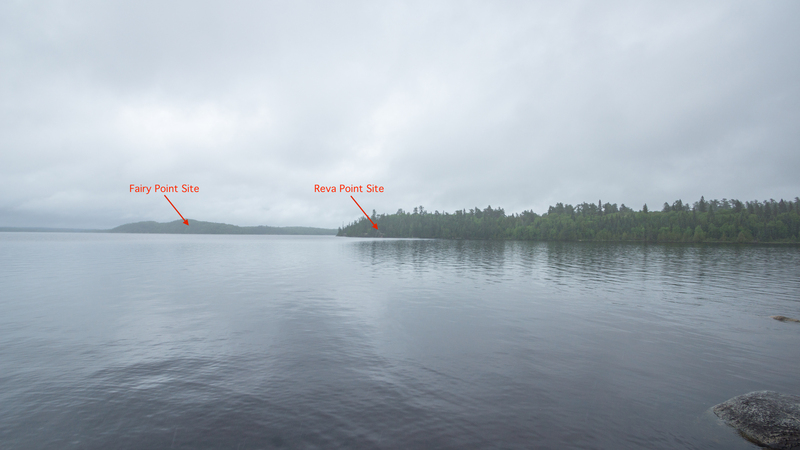 Click on the image below to see the locations of both Reva Point and Fairy point pictograph sites from the north end of Reva Island. 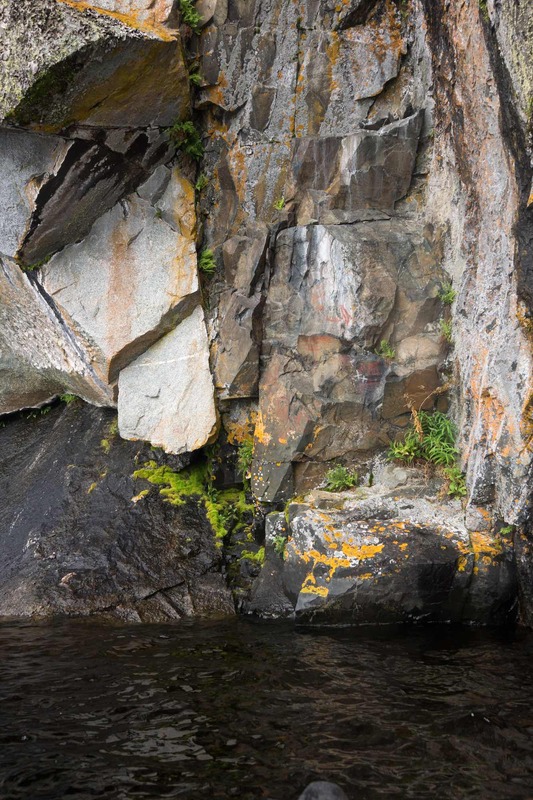 Along with the Diamond Lake pictograph site in Temagami, the Fairy Point site must be one of the most visited in northern Ontario. 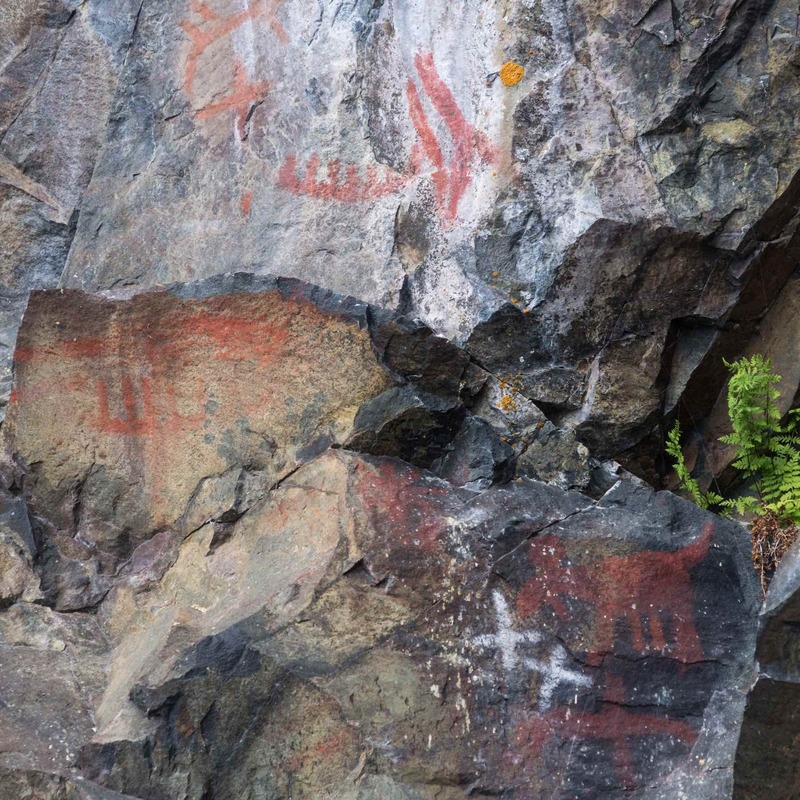 The annual influx of canoe trippers coming in from the Crooked Lake portage on the start of their journey to Mattice or Moosonee, pass right by the pictographs. That is if they know they are there and have lucked into some calm water as they make their way south to the point. 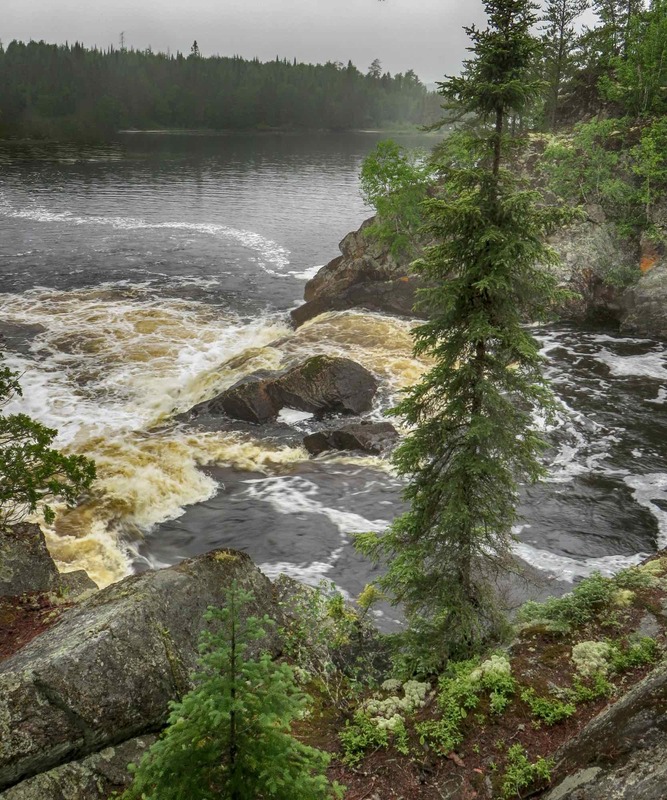 Given its location, even moderate winds from the SW can have some nifty waves crashing into the point, making the thought of sitting there with a camera and contemplating Ojibwe rock paintings less important than just getting down the lake! 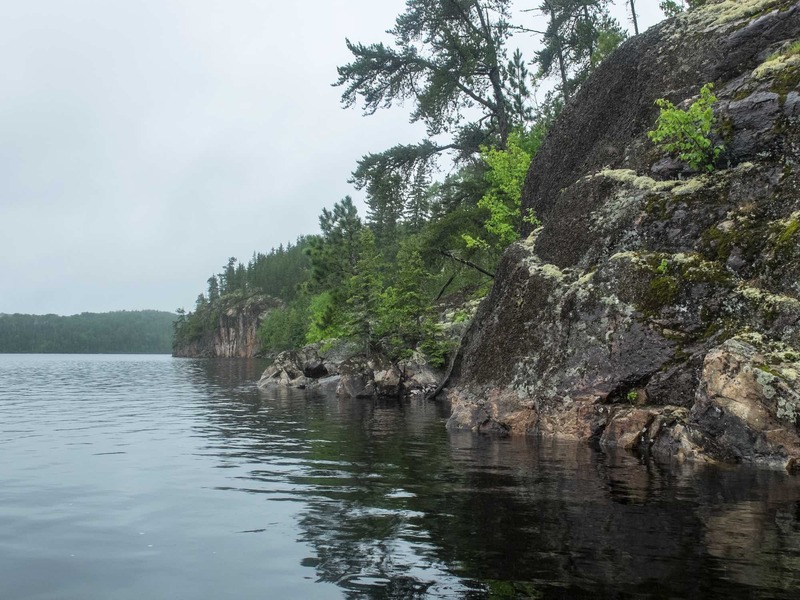 If they do stop they will be looking at the most impressive stretch of rock face on the entire lake, a point not lost on the Anishinaabe shamans and vision questers who came here two and three hundred years ago – and maybe longer ago than that. 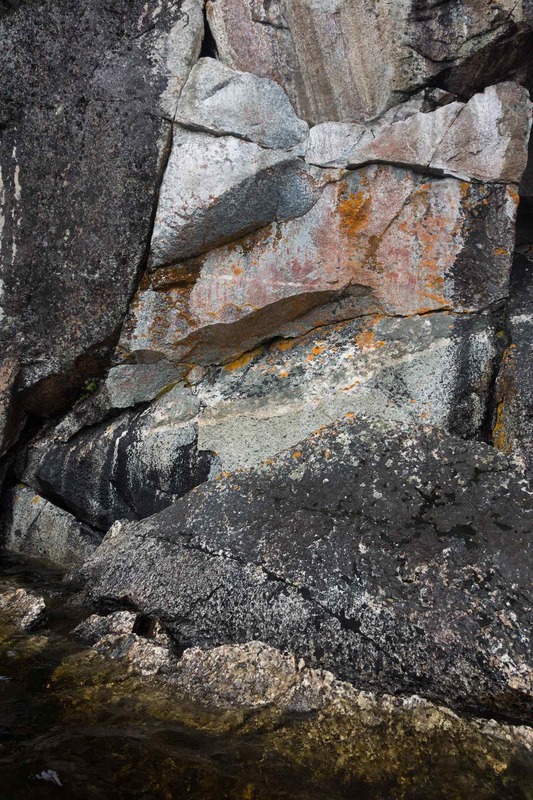 The rock face was to them the home of the maymaygweshiwuk, the “little men” who served as go-betweens to the manitous, the spirits who could grant the visitors the medicines and favours they sought. From this traditional Ojibwe understanding of the Point comes the English name “Fairy” -“small imaginary being of human form that has magical powers”. 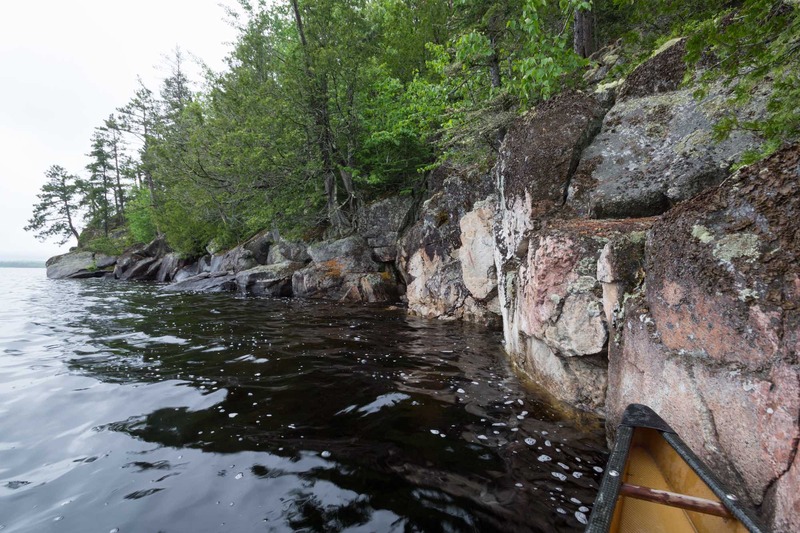 In our visit to the pictographs of Fairy Point, we came at it from the south and paddled north for 900 meters before heading over to Red Granite Point and a campsite. In Selwyn Dewdney’s 1958 visit, he recorded his impressions in a north-to-south order in terms of various “faces” (his term for what others refer to as panels) with the most northerly one being Face I and the most southerly one being Face IX. According to Conway’s count, there are 236 paintings on thirty panels. Unclear is exactly what makes up a painting. Does each line in a row of 11 tally marks, for example, make up one or 11 paintings? We would not see IX faces or 30 panels in our slow paddle along Fairy Point. What we did see, however, far surpassed the one and only panel we had been familiar with in our four previous fly-by’s of the site! Our visit began with the following stretch of rock at the south end. 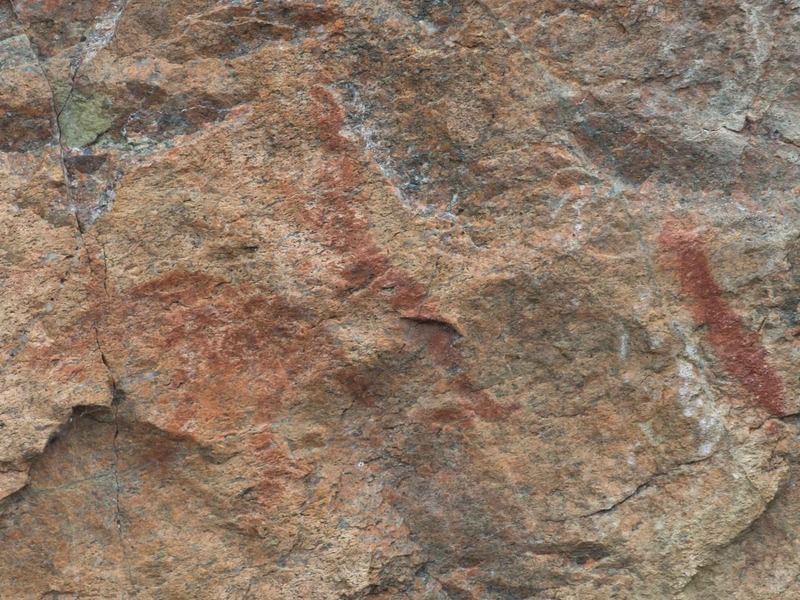 The image below shows the first two ochre paintings we saw – two slash marks, with the one on the right having “arms” or fins. 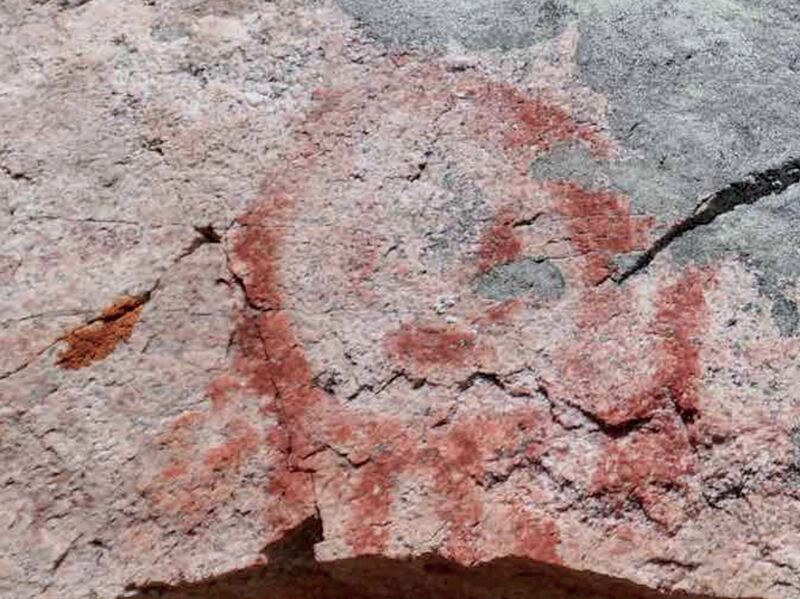 It reminded us of a similar fish image at Agawa Rock. On we went until we came to the bit of vertical rock surface in the photo below. “Move along. Nuthin’ to see!” Well, there were a few splashes of hematite including a J figure and a series of vertical lines. We had been to Fairy Point before so we knew there was more in store for us, although to be honest the only panel if images we could remember was the most obvious one, the one with the animals and the circle with a smile in it. And there it was! 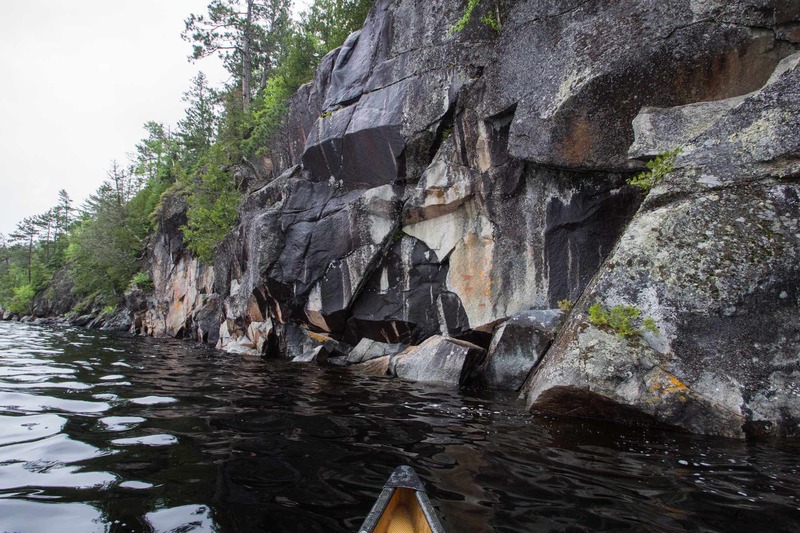 In the early 1980’s heading down the Missinaibi had been an annual thing and each time we passed this rock face. Once Max even took out his Nikon EM and snapped a photo; the other times we were just keen to get down to the river itself for the thrills and spills of the rapids. Now we had lots of time and thanks to the light wind the water was relatively calm. 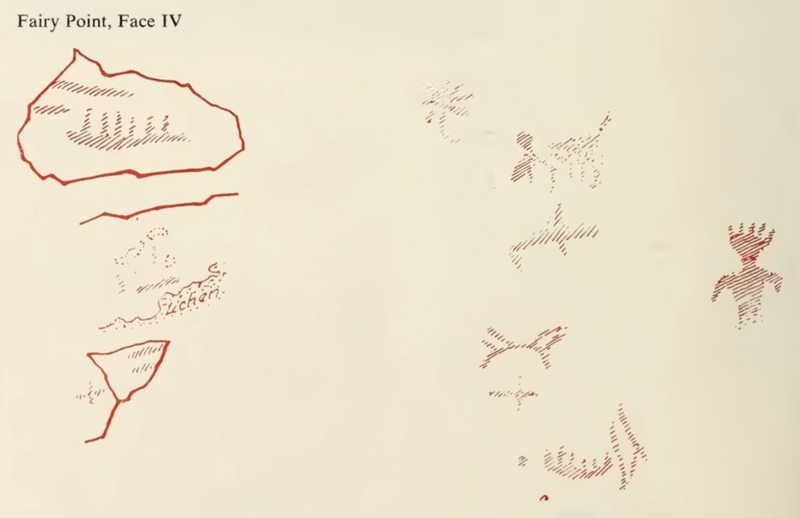 Dewdney labelled this pictograph panel Face IX; his book includes a sketch – see below – of most of the images. 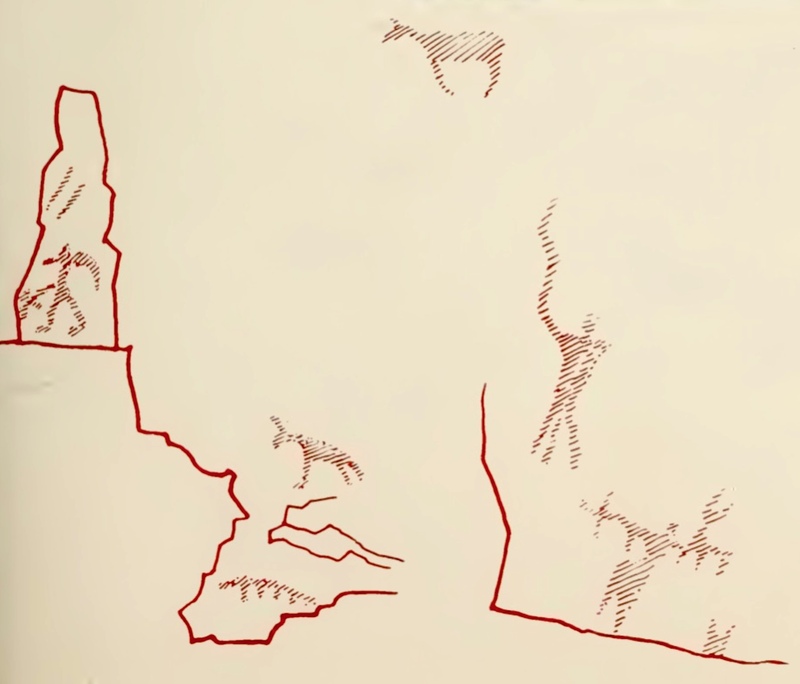 Not included in the Dewdney sketch is the row of nine tally marks on the right side of the panel next to the caribou; also missing is the small bear image located below the inverted Y (or whatever it is). Given the rudimentary skills of the “painter(s)” and the assumed presence of Mishipeshu, the inverted Y as the horned serpent would seem not be totally far-fetched! And what to make of the circle that emoji culture will have us see it as a smile? And what is with the seven “legs” or “rays” attached to the bottom of the circle? A common explanation is that it is a sun symbol with the lines represent rays or spiritual power being transmitted by the manitous to those who have come to this site. 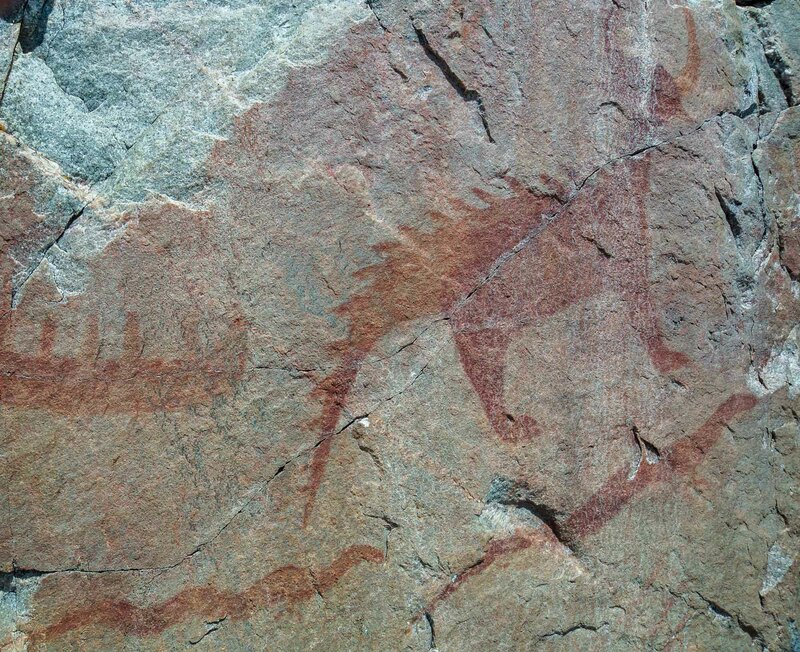 On Little Missinaibi Lake (Site #2) there is a similar pictograph. It too has lines below the circle – at least four and maybe more. Inside the circle are what look like eyes and a mouth! The best explanation? 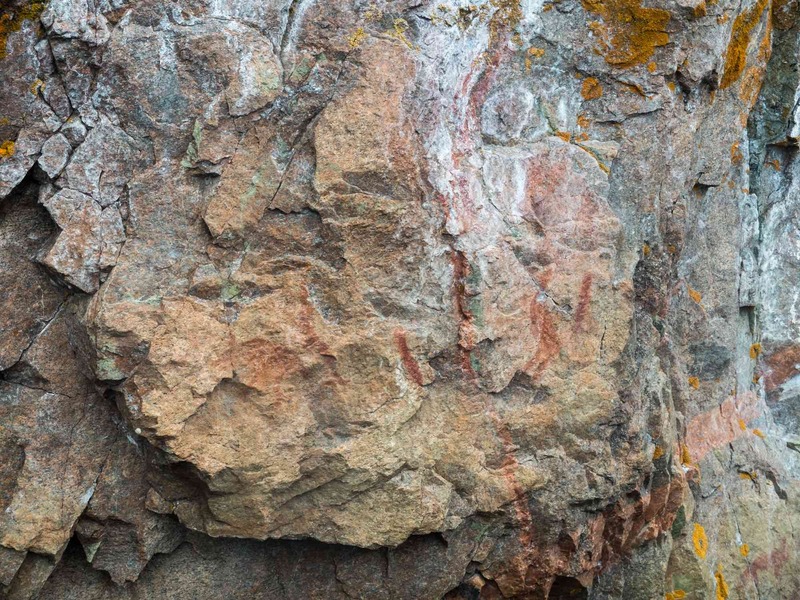 It once had the same semi-circular arc seen on the Fairy Point pictograph but bits of it have eroded over time to create what some will see as facial features. 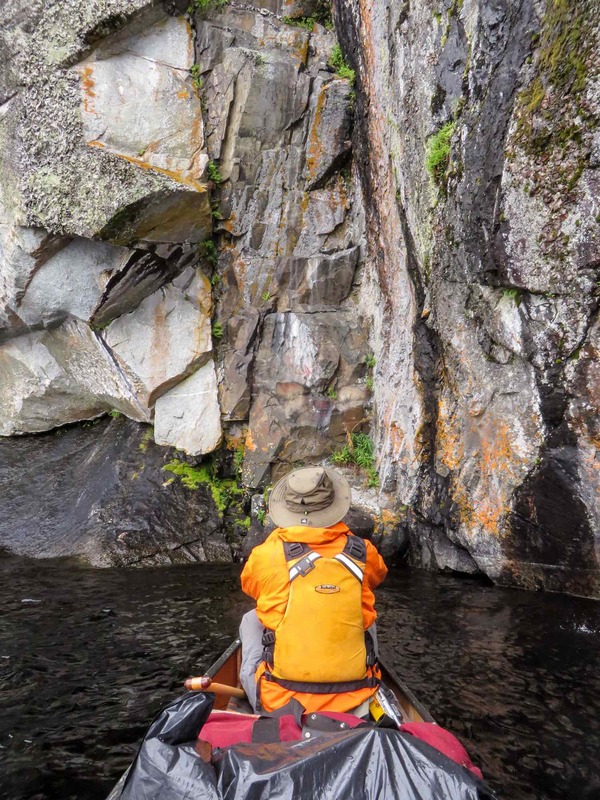 Just north of Dewdney’s Face IX, we paddled by the four slash marks seen in the image below. 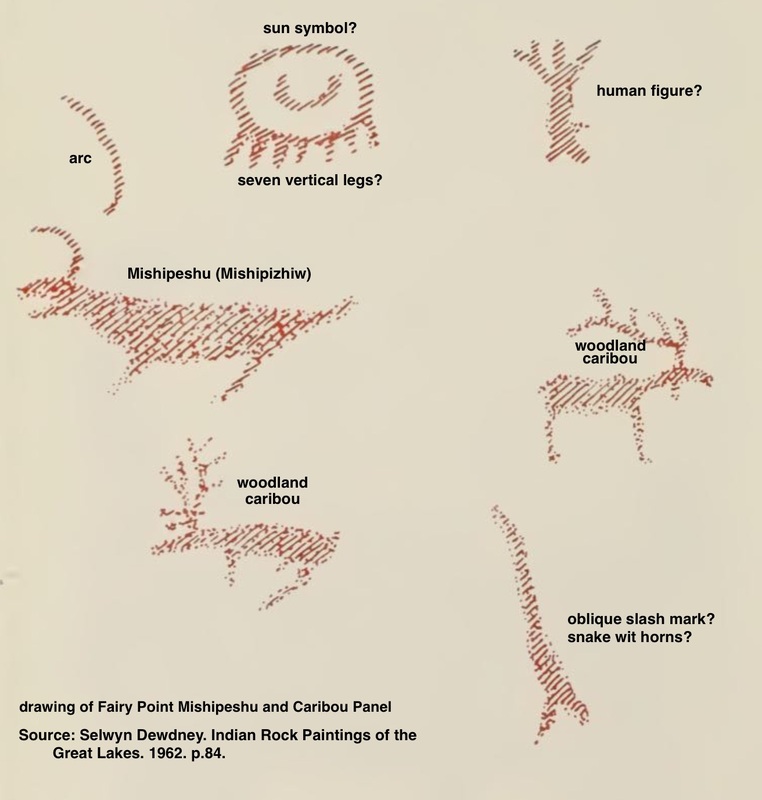 That brought us to Face VIII, another of the panels that Dewdney made a drawing of and which appears in Indian Rock Paintings Of The Great Lakes. 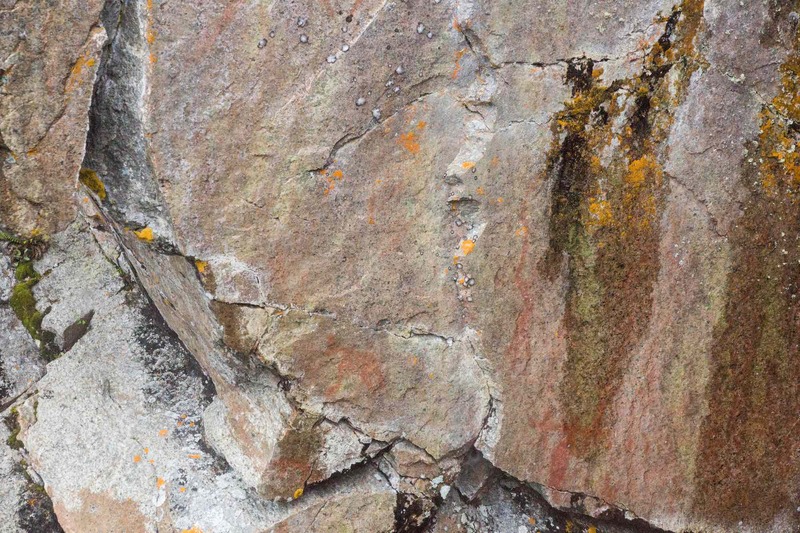 In the sixty years between Dewdney’s visit and ours, lichen growth has obscured much of what is there. 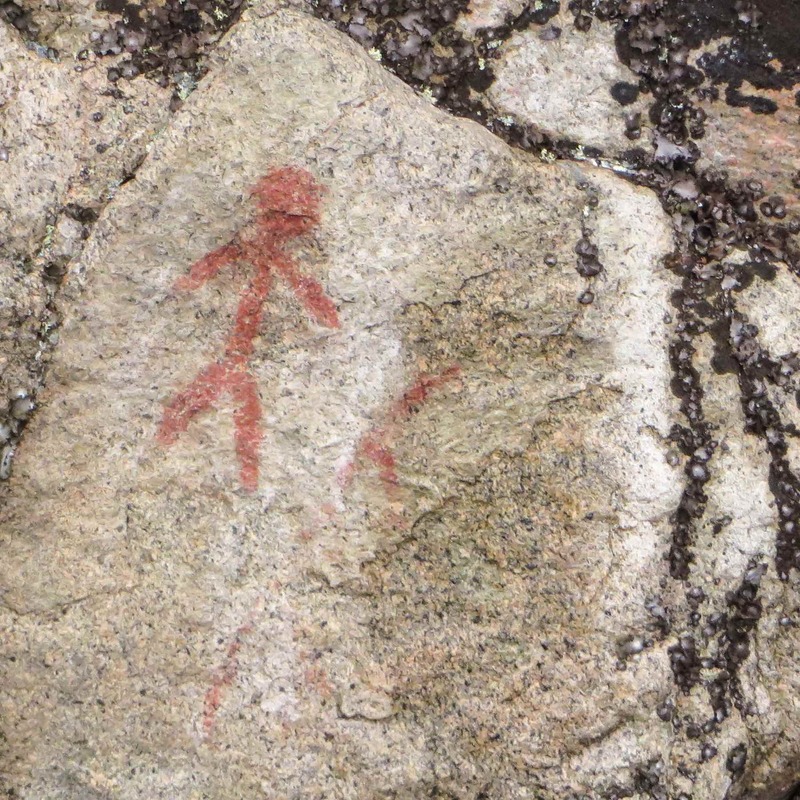 If not for his drawing we would not have even seen over half of the pictographs! Other than the cross and the animal with the two prominent ears or horns, little could be made out. Click on the images to enlarge and see if you have better luck! The vibrant colour of the “stick man” makes him jump out as you paddle by. 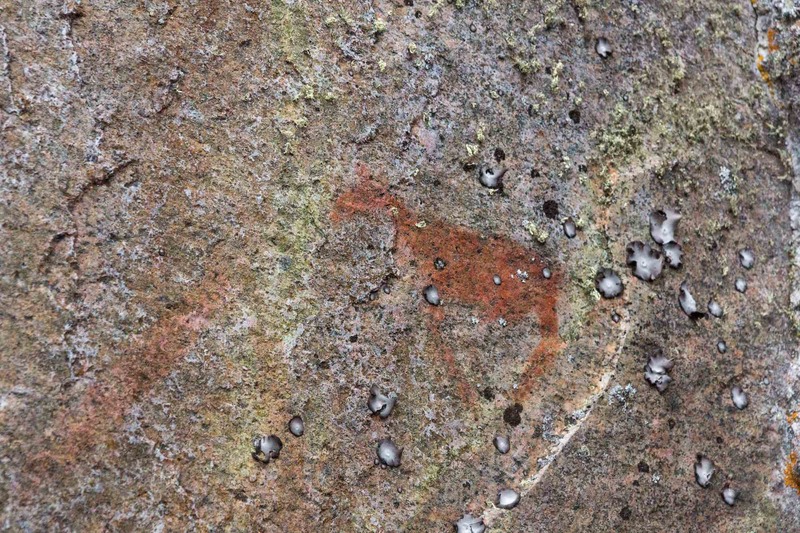 Next to him are some faded ochre markings, an upside-down Y and the remains of an arc. The spindly elongated figure may be what he is referring to though we did not recognize it as such at the time. The clearest image was the moose figure at the top of the panel. Dewdney. Fairy Point. Face VI. Along with the Mishipeshu and the Caribou Panel (Face IX) this panel had the greatest number of “readable” images – i.e. ones which have strong colours and clear shapes. Of course, what they all mean and how – if at all – they relate to each other are other issues that won’t be resolved soon! I am left wondering about the formulation of this white “paint”. The other question, of course, is “Why crosses?” or more to the point “Whose cross?” Is it a reference to the symbol that seemed to the natives to be one of immense power to the Jesuits. Is a reference to a possible Midewiwin (exclusive Ojibwe medicine society) cross that predated the arrival of the Europeans and their mythology? 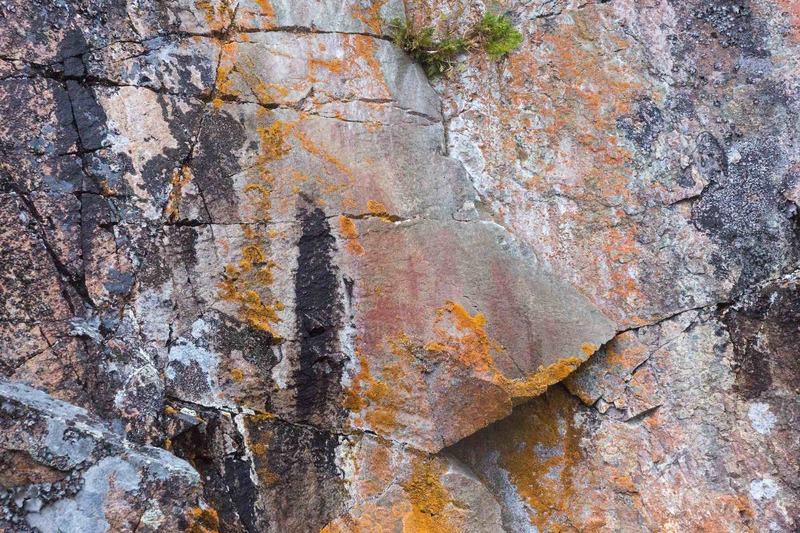 The first image below is an overview of the panel; it is followed by others which focus more closely on various sections of the overall rock face. For some reason, Dewdney does not include the bottom half of the panel in his sketch. This includes the distinct white crosses that he makes reference to. We are now about 400 meters from where we started our Fairy Point scan. 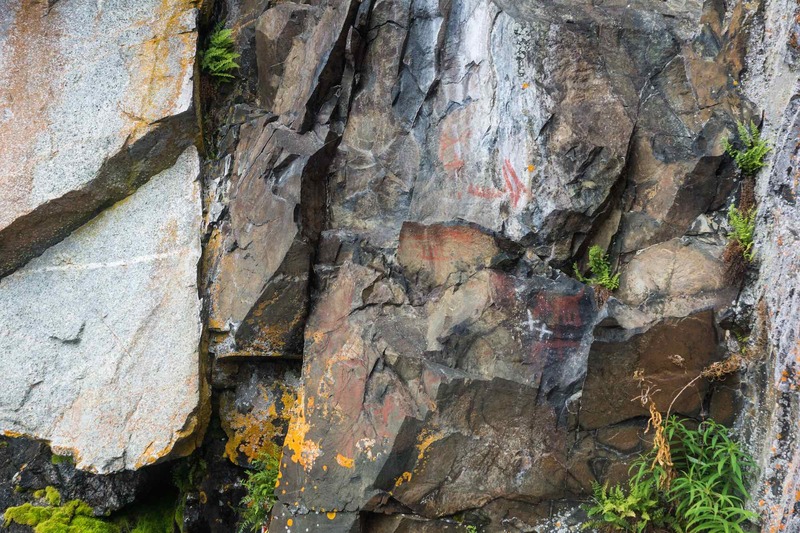 Coming up are a few more humble rock paintings – animal figures, geometric forms, vertical slash marks, and others probably hidden under that black lichen cover. 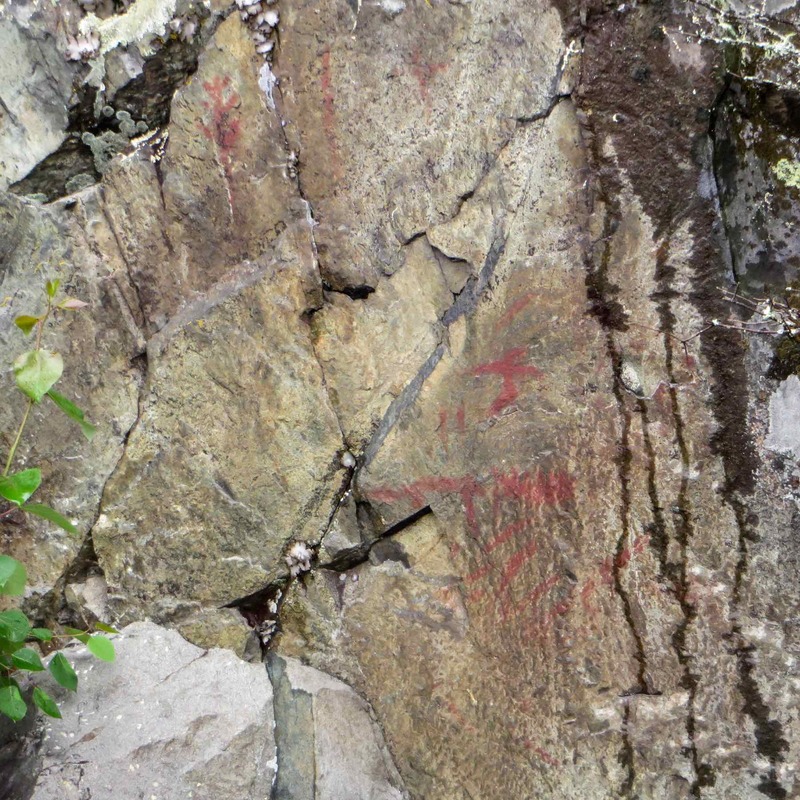 A small bear figure can be seen on the right of the rock face e below; the other red “markings” may just be exposed red granite. We couldn’t decide. We noticed a small German flag placed below the moose pictograph in the photos above and below. Perhaps German paddlers at the start of their epic Canadian adventure had left something for the manitous? moose and tally marks – and a mini German flag! 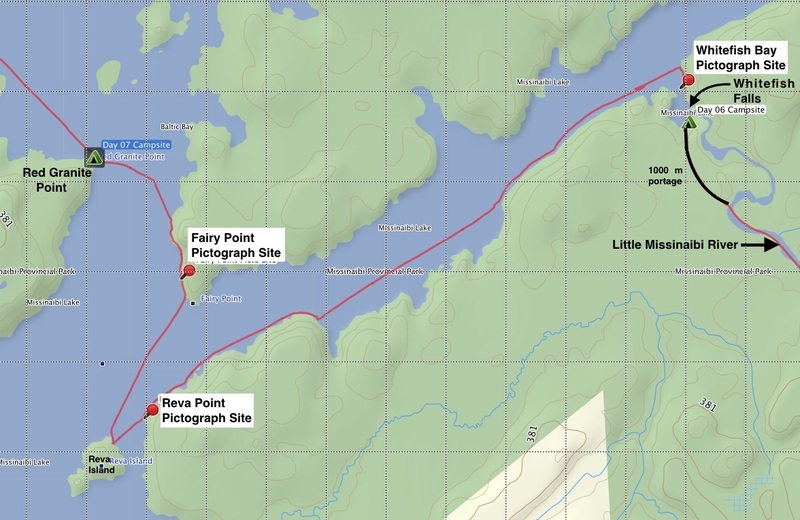 Our GPS track tells us that we only spent 35 minutes paddling Fairy Point from south to north! Strange because it felt much longer and more like we had stepped out of time completely! As we came to the end our thoughts turned to a campsite for the night. 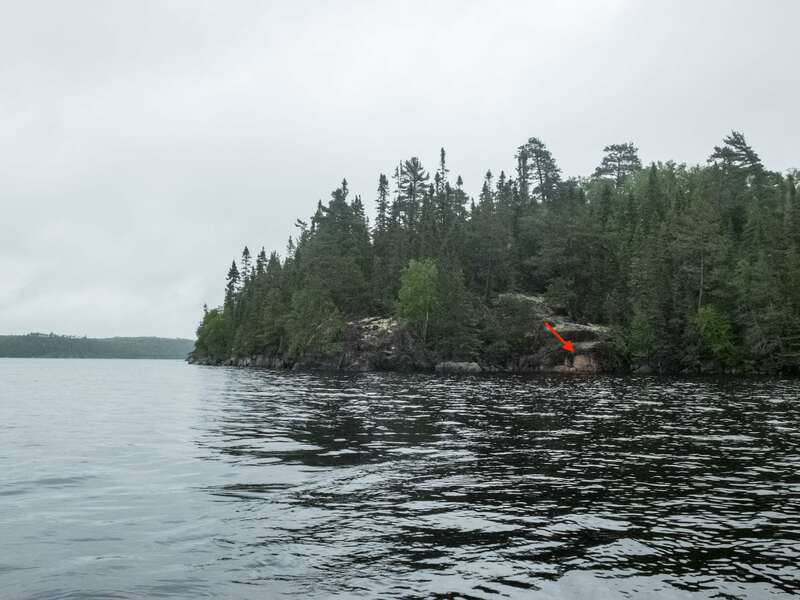 Our initial trajectory to an island campsite 1.5 kilometers to the north was changed when we saw the closer – and inviting – Red Granite Point site, complete with some horizontal rock frontage. And an added bonus – as the afternoon turned into the evening we were treated to the view of Fairy Point glowing as the setting sun lit it up. 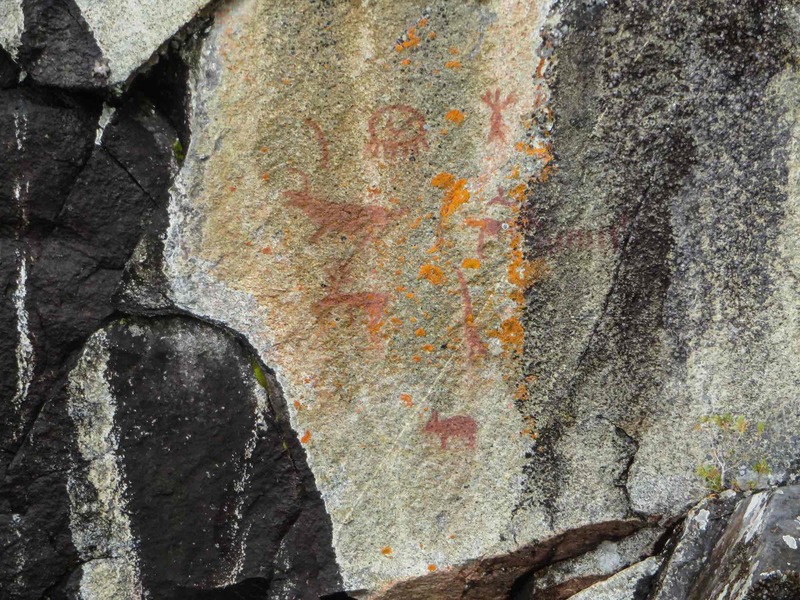 Had we been more on the ball we would have paddled back over there for some “Golden Hour” shots of the pictographs. It would have given us a chance to see some of the many panels and rock images that escaped our view. Instead, Helinox chairs in service, we sat on that rock patio of ours and sipped on our maple whisky. 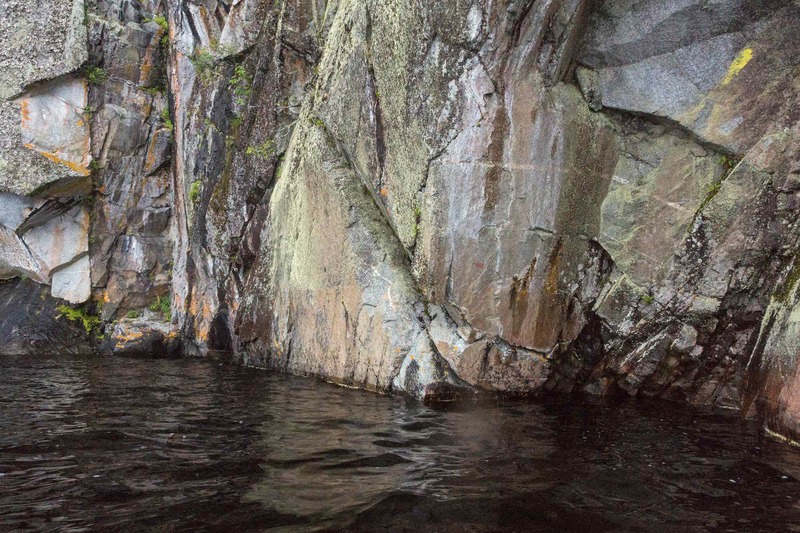 We had paddled less than ten kilometers and visited three pictograph sites and the wind and rain never dialled it up beyond “gentle” – what a great day it had turned out to be! Fairy Point site from Red Granite Point campsite about 8 p.m.
Bill Steer (aka Backroads Bill) has an excellent article on the Fairy Point site. 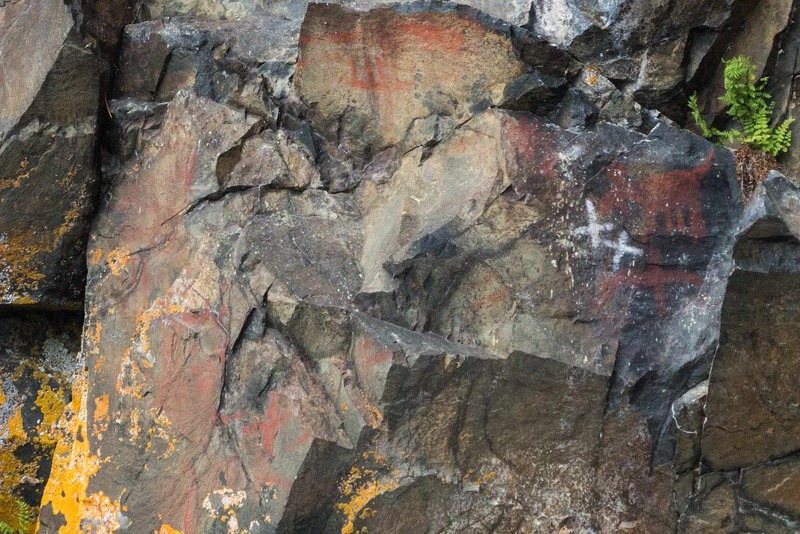 Click above on the header to Steer’s website to access the article – or click on the title – The Rock Fairies – Spiritual Pictograph Site. My post relied heavily on Dewdney’s research and drawings. 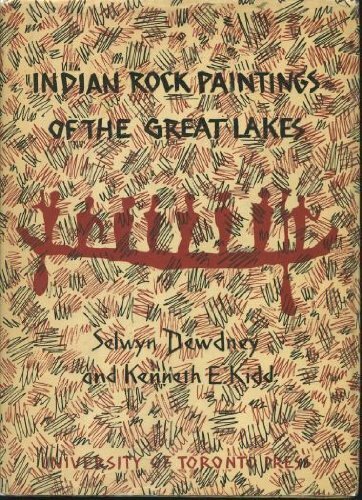 To provide easy access to the pages of Dewdney’s Indian Rock Paintings Of The Great Lakes that deal with Fairy Point, I created a pdf file of the relevant pages. You can download the 1.6 Mb pdf document here. 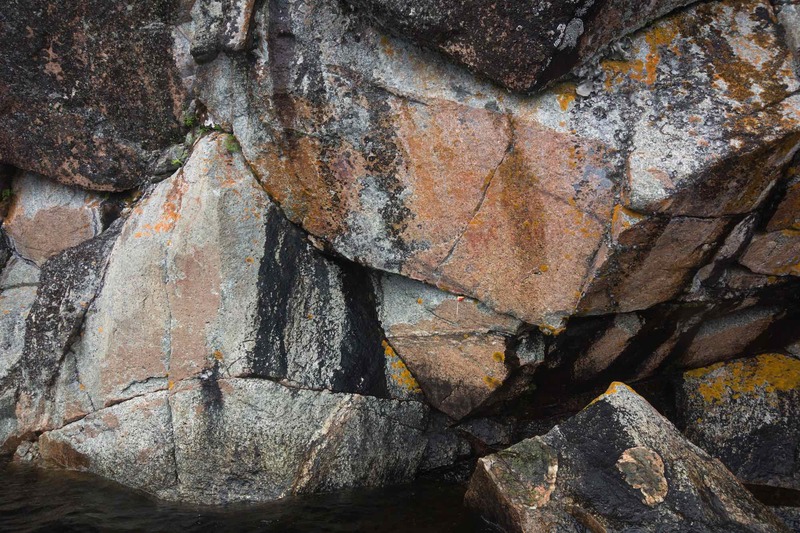 After Fairy Point, Selwyn Dewdney was off to Agawa Rock on the eastern end of Lake Superior. He was overwhelmed by what he found. Click here to read his account! 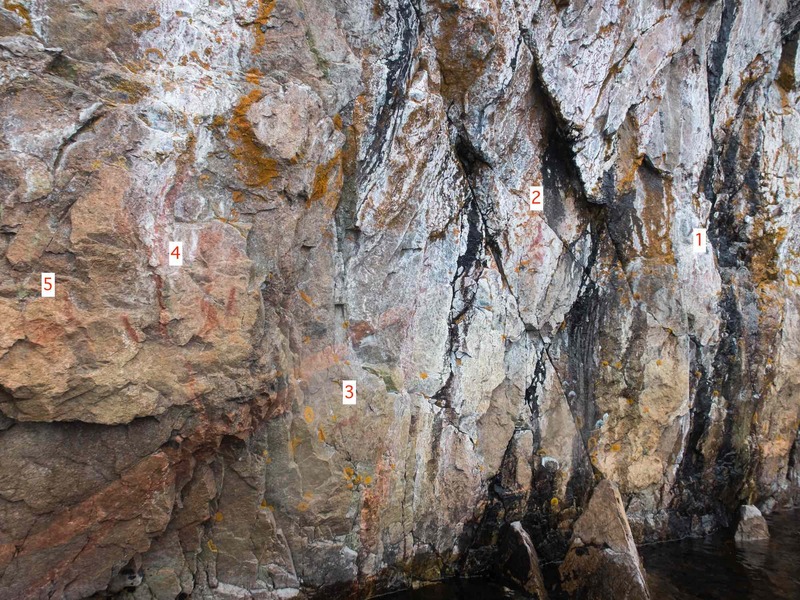 Twenty-five years later Thor Conway and his wife Julie would do major work on the pictographs of Agawa Rock, combining the then-novel use of acetate sheets (instead of the rice paper previously used) to copy the images underneath. As well, they spent hundreds of hours interviewing local elders about traditional Ojibwe culture. 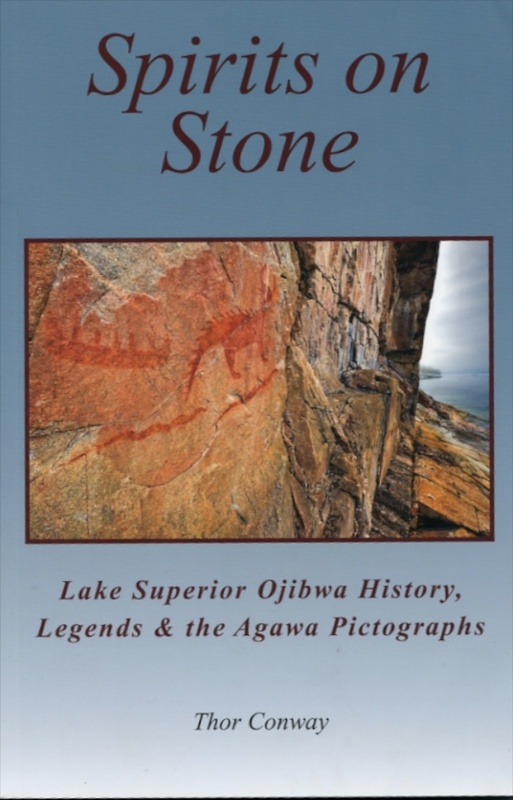 His book Spirits On Stone (the 2010 edition of a book first published in 1991) presents the pictographs in the voice of the descendants of the Ojibwe who painted them. If you’re interested in the topic, it is a book worth getting. 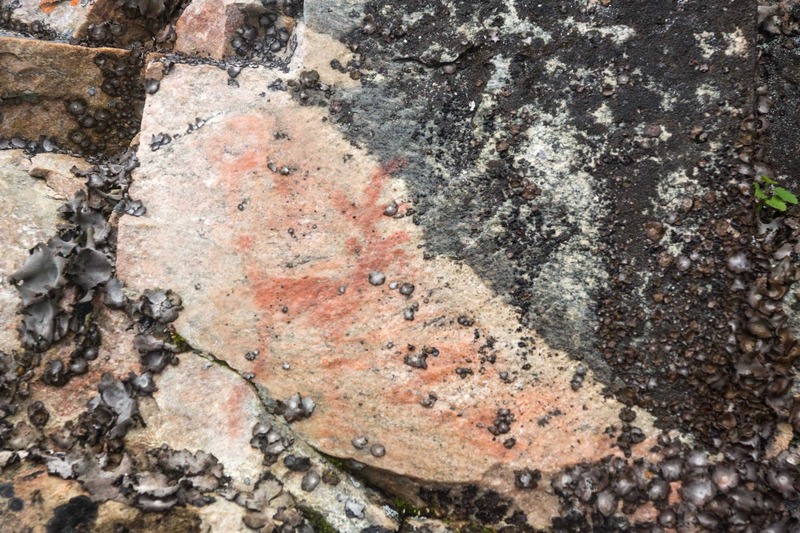 This entry was posted in Pictographs of the Canadian Shield, wilderness canoe tripping and tagged Dewdney Missinaibi, Fairy Point rock painting, Missinaibi cross image, Missinaibi Mishipeshu and caribou, Missinaibi pictographs, Missinaibi smily face, Red Granite Point, Reva Point pictographs, Reva Point rock painting, Thor Conway Missinaibi, Whitefish Bay archaeological site, Whitefish Bay Missinaibi pictographs, Whitefish Falls rock painting. Bookmark the permalink.